Trends in Logic is the conference series of the journal Studia Logica (see http://www.studialogica.org/ and http://www.springer.com/philosophy/logic+and+philosophy+of+language/journal/11225). The 11th Trends in Logic international conference will be held at Ruhr University Bochum, Germany, from June 3-June 5, 2012 under the title “Advances in Philosophical Logic”. It is organized by the chair of Logic and Epistemology at the Department of Philosophy II of Ruhr University Bochum, in co-operation with Studia Logica. Studia Logica was founded in 1953 by Kazimierz Ajdukiewicz, one of the prominent representatives of the Lvov-Warsaw School, who aimed to promote research embodying the main idea of the School, namely to apply mathematical methods to important philosophical problems. Since its very first issue, Studia Logica has joined the forces of mathematicians and philosophers in carrying out logical investigations. The success of the Lvov-Warsaw School united philosophy and mathematics in novel and deep ways. 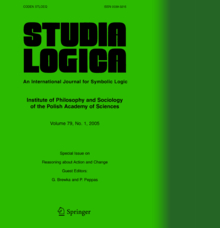 The papers published in Studia Logica have testified to the fact that the School's thought not only has not gone out of date but still remains a weighty source of inspiration for those who approach philosophical problems by means of formal methods.